A poster announces Dr. Simon's lecture. 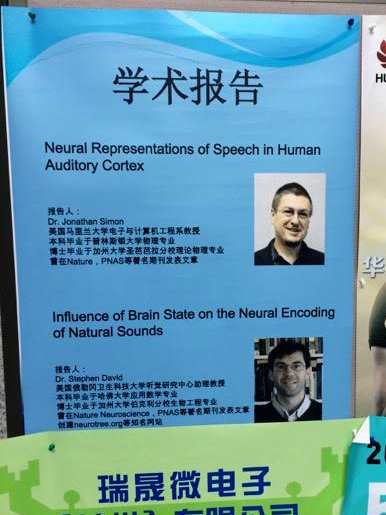 Professor Jonathan Z. Simon (ECE/Biology/ISR) gave invited lectures on “Neural Representations of Speech, and Speech in Noise, in Human Auditory Cortex” in three different locations in China during September. 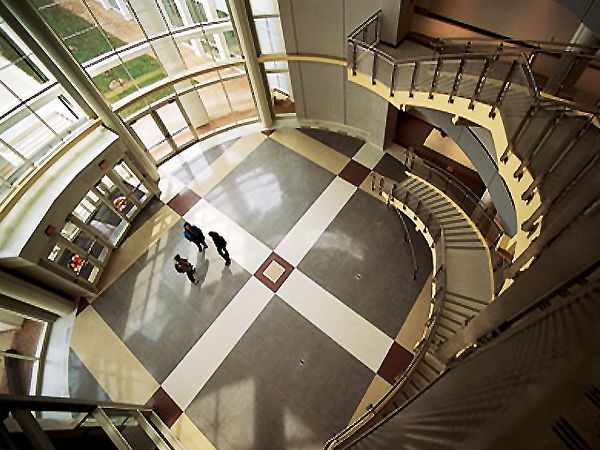 In his talk, Simon explained research into how continuous speech---whether presented alone, degraded with noise, or masked by other speech signals in a complex auditory scene---is represented in the human auditory cortex. Simon uses magnetoencephalography (MEG) to record the neural responses of individuals listening to continuous speech in a variety of listening scenarios. 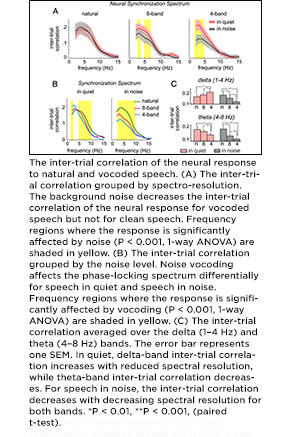 Comparisons of the dynamic cortical responses and the auditory stimuli reveal a common set of cortical representations of natural speech. Interestingly, he finds that cortical representations of continuous speech are robust to noise under a wide variety of conditions, including clean speech, additive stationary noise, band-vocoded speech and noise, and speech with competing speakers. In the last case, individual neural representations of the speech of both the foreground and background speaker are observed, with each being selectively phase locked to the rhythm of the corresponding speech stream. Critically, the cortical representation allows the temporal envelope of the acoustic speech stream to be reconstructed from the observed neural response to the speech. Simon also explained how these cortical representations of speech are strongly affected by aging. 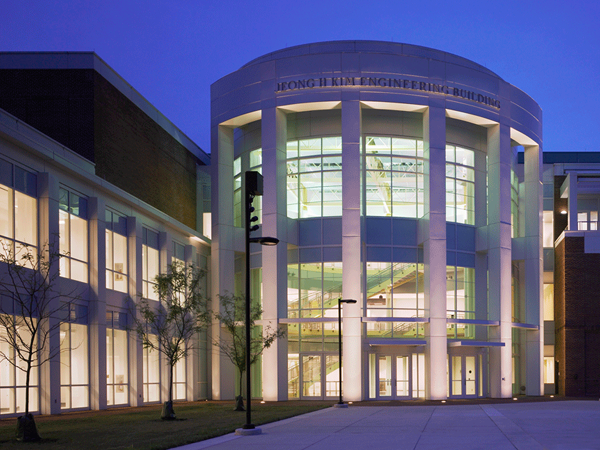 On his trip, Simon gave invited lectures at the McGovern Institute for Brain Research, Peking University, Beijing; the NYU-ECNU Institute of Brain and Cognitive Science, jointly sponsored by NYU Shanghai and East China Normal University, Shanghai; and the College of Biomedical Engineering and Instrument Sciences, Zhejiang University, Hangzhou.